Organisations have only four more months to move from Windows XP before Microsoft stops supporting the venerable operating system. It is also common practice for systems administrators to delay adoption of new operationg systems until the first service pack, but with Windows 8.1 out of the door, there has never been a better time or a more pressing need to migrate to Microsoft's latest OS. Organisations can't afford to be one, two or three Oss behind. It is time to bite the bullet and embrace Windows 8. But it is important to make a few decisions when migrating to the new OS. If you have legacy desktops and applications, you may find that installing a 64-bit OS not suitable for your needs. You may have to stick with 32-bit if there are no available 64-bit drivers for old hardware and applications. But 64-bit has its plus points. The biggest of these is memory. The 64-bit version of Windows 8 can support more than 3GB of memory. Future applications may have large memory requirements that better suit 64-bit environments. 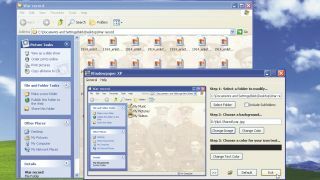 In addition, Microsoft says that Metro style applications have a minimum of 1,024x768 screen resolution, and 1,366x768 for the snap feature. Migration tools can take the strain of updating lots of desktops by transferring operating systems and application settings and even apps and drivers from the old OS to the new one. This will save the user time in not having to set up their applications again in the way they had them pre-upgrade. When moving to a new operating system, there are two ways of going about this: Upgrade an existing system or start afresh with new hardware. If you are running Windows XP, then you may find the requirements a little beyond what that PC would have, upgrading the hardware may be required before an upgrade. Upgrading the OS will allow you to transfer user and application settings in certain circumstances. With Windows 7 PCs, an in-place upgrade can be carried out that allows the user retain all files, settings and compatible applications. With Vista, if Service Pack 1 is installed, personal files and system settings are kepts, but applications will have to be re-installed. For Windows XP users, upgrading is possible without a fresh install if Service Pack 3 is installed, but only personal files will be kept. A fresh or "clean" install can be done if no settings are to be transferred or the machine itself is completely new. Applications built for previous operating systems may not work so well in Windows 8 (if at all). So it is best to test the operating yourself with various apps that the organisation uses to make sure that critical business application still runs. Those that don't can then be flagged for vendor support to see if an updated version is in the works.